With new Toyota Camry, Honda Accord and Nissan Altima sedans on the horizon, Toyota's Jack Hollis says: “When you get into next year and you look at 2018, I believe with these three products and the excitement they bring back to that segment, I don't see it falling anymore." Editors note: Sales figures for the U.S. midsize car segment from 2015 were incorrectly reported as 2016 figures in an earlier version of this story. DETROIT -- Midsize cars were among the biggest sales losers last year as customers flocked instead to crossovers and other light trucks. But good old competition may reinvigorate the segment as soon as next year, when Japan’s big three roll out redesigns of their flagship four-doors. 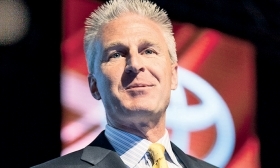 Jack Hollis, group vice president for marketing for Toyota Motor Sales U.S.A., predicts falling midsize sedan sales will not only flatten out but may even start to increase again in 2018. The segment’s stabilization will begin with the launch of the redesigned Toyota Camry this summer and be reinforced by the expected introduction of a next-generation Honda Accord in the autumn and then the redesigned Nissan Altima in early 2018, Hollis predicted. “When you get into next year and you look at 2018, I believe with these three products and the excitement they bring back to that segment, I don’t see it falling anymore,” he said at the Detroit auto show, where Toyota unveiled a sporty, aggressively styled next-generation Camry. Hollis’ assessment wasn’t universally held at Toyota. North America CEO Jim Lentz said the rush of new sedan product will stimulate overall demand, but that it would likely only slow the rate of segment’s decline. The segment still accounts for about 2.5 million people, who are predisposed to returning to the market in search of another sedan. But whereas the booming crossover and SUV segments have been flooded by new nameplates that dilute each nameplate’s market share and volume, the midsize sedan segment has had a stable lineup to go-to models fighting over the pie. Last year combined sales in the midsize car segment slid 12 percent to 2.1 million vehicles, but still accounted for 31 percent of the overall car market. The Camry led the segment but was down 9.5 percent to 388,618 vehicles. Sales of the second-place Honda Accord were down 2.9 percent to 345,225, while the No. 3 Nissan Altima was down 7.8 percent to 307,380. Hollis predicted the Camry would extend its 15-year run as America’s best-selling car, buoyed by robust customer retention rates around 60 percent and across-the-board improvements. The Camry, Hollis said, ranks behind only the Tacoma for customer retention among Toyotas.